Time of year again where the dead come out to play… and drink has passed, but Pub Dread was one of the hottest pop-up bars this year. 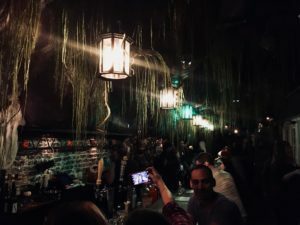 Shaw neighborhood bar owner Derek Brown and the Drink Company outdid themselves again with this Halloween themed pop-up. Apparently, when designing the rooms, employees were interviewed about their deepest fears, which were then brought to life. When you entered the bar, you were immersed into the haunted forest. Watch where you go because you might run into a snake hanging from the ceiling or spiders crawling on the walls. Don’t worry they are fake of course… right..? Adjacent to the forest was the doll parlor, filled with hundred of vintage dolls and toys. It looked like they raided every antique shop in a 30 mile radius. They even had a doll named Cordelia, who is suppose to be haunted. Some of the employees noticed her messing with their phones. Next was the crypt. You would find it decorated with tombstones with the names of the employees on them. They also had these coffins that are great for taking pics in. Thankfully, the last room was less scary. The “Spacebar” was dedicated to the late David Bowie. There was a giant mural of him on one of the walls, astronauts and disco balls hanging from the ceiling, and colorful lights electrifying the room. The cocktail menu incorporated fall flavors such as apple cider, pumpkin, and yummy gummy brains. Drinks such as The Dead Will Walk Again and BeetleJuice! BeetleJuice! BeetleJuice! were crowd favorites. They set you back around $14, but trust me, these drinks were one of a kind. You’ve probably heard of their other popular pop-up bar themes including Mario Kart’s Cherry Blossom Garden, Christmas themed Miracle on Seventh St., or the summer hit of Game of Thrones. Each one keeps setting the bar higher and higher.